Sweet Sleep Flannel Antimicrobial Bed Sheets. These sheets are manufactured in Canada in Ottawa, Ontario. This Flannel is Double brushed for luxurious softness and warmth. They resist pilling better than any product on the market. Add a fun look to your bedding with this Cuddl Duds printed fleece sheet set. DOG/PUPPY PRINT. Fitted sheet fits most mattresses 16" deep. Brush material finish. Fitted sheet: 49" x 75". Machine wash, wash before using. NEW FULL FLEECE SHEET SET DOUBLE FITTED SET DEER PRINT RED ULTRA SOFT SHEETS! Full/queen set includes 1 flat sheet, 1 fitted sheet, 2 standard pillowcases. printed, ultra soft. NEW QUEEN FLEECE SHEET SET FITTED SET GRAY MOOSE PRINT ULTRA SOFT WARM SHEETS! Twin set includes 1 flat sheet, 1 fitted sheet, 1 standard pillowcase. full set includes 1 flat sheet, 1 fitted sheet, 2 standard pillowcases; queen set includes 1 flat sheet, 1 fitted sheet, 2 standard pillowcases. "Rainer Beige". TWIN FLEECE SET. 1 flat, fitted and 1 standard pillow case. 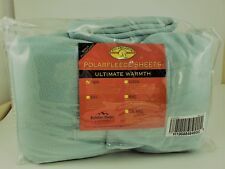 Cuddl Duds Gray KING MicroFleece Polartec Fleece Cozy Layers Sheet Set. 1 King Flay Sheet 106 in. 1 King Fitted Sheet 73 in. (fits up to a 17 in. deep mattress). 2 King Pillowcases 21 in. Hard To Find Solid Color! (Blissful Bamboo Sheet Set. Flat sheet and pillowcase have generous 4" hems and pretty petite hemstitch detail. Set includes: 1 flat sheet, 1 fitted sheet, 2 standard pillowcases. Fabric: 100% rayon from bamboo :). Add a fun look to your bedding with this Living quarters gray snowflake printed fleece sheet set. Full- Sheet: 80" x 98"; Fitted sheet: 54" x 75" x 14"; Case: 20" x 30". Machine wash. 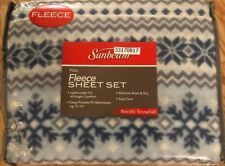 This auction is for a BRAND NEW in the package, queen size set of soft and cozy polar fleece sheets by SUNBEAM. They are done in a Nordic Snowflake pattern done in blue and gray. The set includes the fitted sheet, the flat sheet and two standard pillowcases. These fit mattresses up to 15 inches deep. Super warm and cozy for the Fall and Winter seasons!. New SUNBEAM Twin fleece sheet set blue & white winter Words "Wonderland" "Cheer"
TWIN FLEECE SHEET SET. 100% Polyester ~ Fleece. TWIN FLEECE SET. 1 flat, fitted and 1 standard pillow case. Sheex Fleece Performance Standard Pillow Cases Green. Condition is New with tags. Shipped with Standard Shipping. 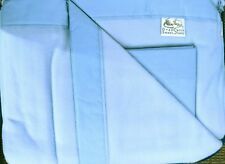 Gorgeous teal/blue twin size sheet set. Cozy up to this Fleece Sheet Set on the chilliest of nights. Made from an ultra-soft fleecy material for optimal comfort, this sheet set is the perfect blend of function and style. Machine wash cold, tumble dry low. The Peak Performance fleece sheets are a step up from any other fleece sheets. The ultra soft fleece sheets are designed not to lint, not to pill, and not to shed for longer lasting quality. The3 mprotection lasts wash after wash.
Machine wash (wash before using). Cuddle duds Fleece Queen Sheet Set. Brand New. Free Shipping. Cuddle duds Fleece tan plaid sheet set. Super soft. Set includes: One Top Sheet, One Fitted Sheet, and two pillowcases. Microfleece for a great comfortable nights sleep. A great gift. Stay warm this Winter. Available Color(s): Grey. 4-Piece Sheet Set Includes 100% Polyester. Machine Washable. Product Details. KING SIZE HEAVYWEIGHT FLEECE SHEET SET KING SHEETS 6 PIECE SET NIP TAUPE. Condition is New with tags. Shipped with USPS Ground Shipping. You are buying one set of Life Comfort king size fleece sheets. This is a six piece set that has the fitted sheet and flat sheet and for pillowcases set is new in package. I will try to answer any questions you have to please ask before buying. Also I will be shipping this USPS ground to save the buyer on shipping cost if you'd like it ship faster I can change to Priority but it'll cost you more in shipping. Thanks for looking. KING SIZE HEAVYWEIGHT FLEECE SHEET SET KING SHEETS 6 PIECE SET NIP GREY. Condition is New with tags. Shipped with USPS Ground Shipping. You are buying one set of Life Comfort king size fleece sheets. This is a six piece set that has the fitted sheet and flat sheet and for pillowcases set is new in package. I will try to answer any questions you have to please ask before buying. Also I will be shipping this USPS ground to save the buyer on shipping cost if you'd like it ship faster I can change to Priority but it'll cost you more in shipping. Thanks for looking. Polar Fleece Sheet Set. Queen Flat sheet 90" x 101". Queen Fitted Sheet 60" x 80". Queen Size. COLOR IS TAUPE. LOOKS LIGHT BROWN (TAN) AND CREAM ZEBRA PRINT. Pillowcase(s). Fully elasticized fitted sheet. Fitted sheet: fits most mattresses up to 16" deep. Flat sheet. Machine wash. Construction & Care. CUDDL DUDS “PINK CATS” “MICRO FLEECE SHEETS SET TWIN SIZE. NWT. HARD TO FIND!! Black Fleece Velvet Soft Queen Bed Sheet Cover Coverlet Bedding 2.3*2.45M . Red Fleece Velvet Soft King Bed Sheet Cover Coverlet Bedding 2.4*2.6M . Black Fleece Velvet Soft Double Bed Sheet Cover Coverlet Bedding 1.8*2.4M .